Fig. 10.1 Total international landings of herring from the North Sea, 1920-88.
the North Sea at different times of the year. The decline in landings first became noticed in the southern North Sea, while only in the late 1960s was there a noticeable decrease in the northern North Sea (Fig. 10.2). These differences in timing are partly attributable to the fact that the North Sea herring is not a homogeneous, randomly-mixing population, but an assemblage of discrete spawning groups that mix on feeding grounds prior to spawning (Fig. 10.3). The first uncertainty was, therefore, that relating to the stock identity of the fish caught: this received a massive input of research without any convincing general conclusion. Research biologists first addressed the cause of the fishery decline seriously in the mid-1950s, following the collapse of the important East Anglian fishery. 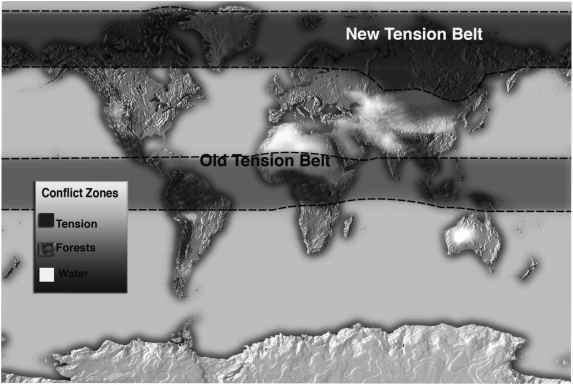 It was not accepted by all scientists that the problem was a global one (in the sense of the total North Sea) until after 1965, in which year a large fleet of purse seiners from Norway entered the North Sea following the collapse of the stock of Norwegian spring spawning herring. Fig. 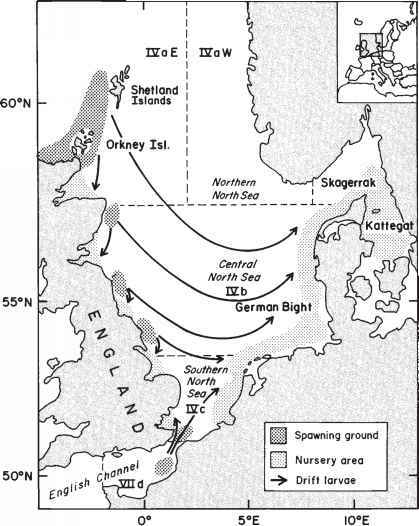 10.2 North Sea herring landings in the four subareas shown in Fig. 10.3, 1947-88.
trols on industrial fisheries for juvenile herring, and on fishing for herring on the spawning grounds. Calculations of equilibrium yield per recruit (that is, the potential yield over its life span from each cohort of herring produced by each year's spawning) gave no indication that there would be any benefit from limiting fishing effort, so long as the number of recruits entering the fishery each year was maintained. Evidence on changes in recruitment was equivocal. There was some indication of a decrease in year class strength for the North Sea as a whole, but it was uncertain whether this was simply part of the natural variability in recruitment or related to the egg production of the stock. Uncertainty in interpretation was transmitted into ambivalence in the advice with quite serious disagreement among the scientists involved. effect is exacerbated by heavy fishing pressure, because the adult stock decreases that much more rapidly. The problem is summarized pictorially in Fig. 10.4. Fig. 10.4 Hypothetical stock-recruitment relationships for North Sea herring: (a) strong dependence of recruitment on spawning stock size and low levels of spawning stock modified by environmental factors; (b) recruitment entirely controlled by environmental factors except at very low levels of stock size. For further explanation, see text. is entirely driven by environmental noise. 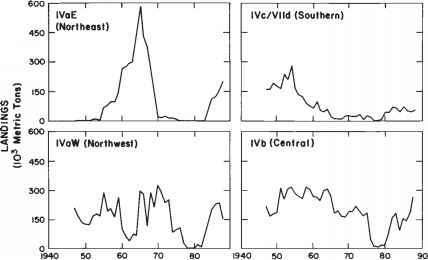 There is no information in the time series plot of recruitment and stock to distinguish between these two extreme possibilities. 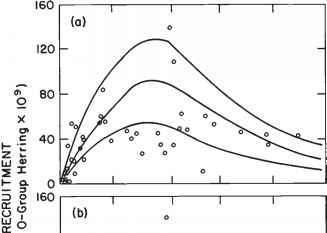 The problem of distinguishing cause and effect is clearly shown by the time series of stock and recruitment shown in Fig. 10.5. During the period of low recruitment in the 1970s, a relationship between recruitment and stock was postulated for North Sea herring. But it is clear that a subsequent sequence of improved year classes from 1980 onwards has been produced from a low spawning stock size. This fails to resolve the issue completely, because the closure of the fishery from 1977 allowed the spawning stock to recover from its very low levels of 1974-77. However, it changes one's perception of the relative importance of stock and environment. Fig. 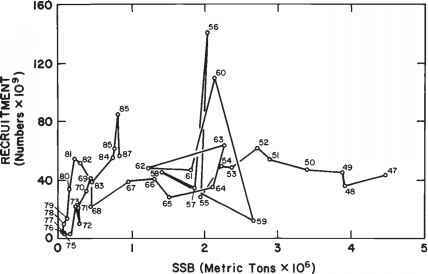 10.5 The time series of points relating recruitment to spawning stock size in North Sea herring.